Photo courtesy of BYU Athletics | Rendering of LaVell Edwards Stadium improvements, featuring new structures and facilities that will connect all four corners of the stadium. 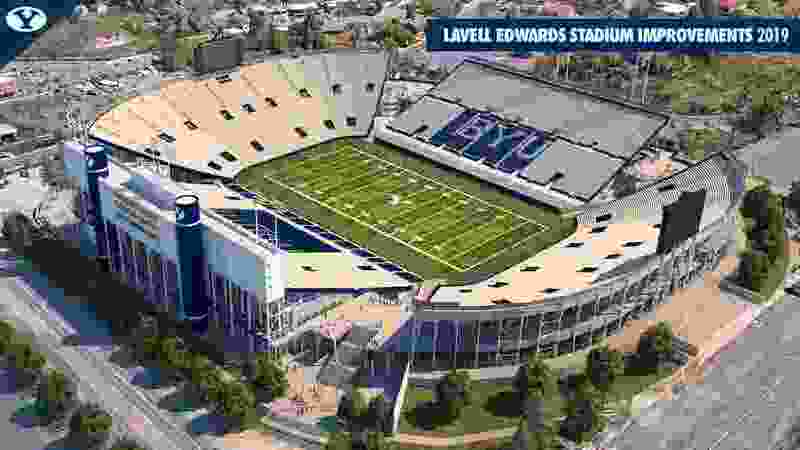 Provo • Having announced last summer that it will be making several improvements to LaVell Edwards Stadium, BYU released renderings of what those changes will look like on Friday. Construction is scheduled to begin shortly. No additional seats will be added, so the stadium’s seating capacity will remain 63,470. School officials are touting the Cougars’ 2019 home football schedule as one of the best in stadium history. BYU hosts Utah on Aug. 29 and will also receive visits from USC, Washington and Boise State. The other two home games are against Liberty and Idaho State. According to the BYU news release from Aug. 15, the project will add structural sections at the four corners of the stadium that will connect the existing four independent stadium stands at the mezzanine level. The improvements will allow fans to walk between the stands without having to return to the ground level. The number of restrooms in the stadium will be increased, with more women’s, men’s and family-friendly facilities on the north and south mezzanine levels. LaVell Edwards Stadium underwent minor renovations win 2003 and 2010 with additional luxury seating and more wheelchair accessibility that dropped its capacity from more than 65,000 to the present configuration. Originally named Cougar Stadium when it opened in 1964, the stadium was expanded in 1982 to accommodate more than 65,000 fans. The stadium was last upgraded structurally in 2012 when new LED video boards at the north and south end zones replaced the outdated and smaller video screens. They are flanked by video ribbons that stretch along the top of the north and south stands.